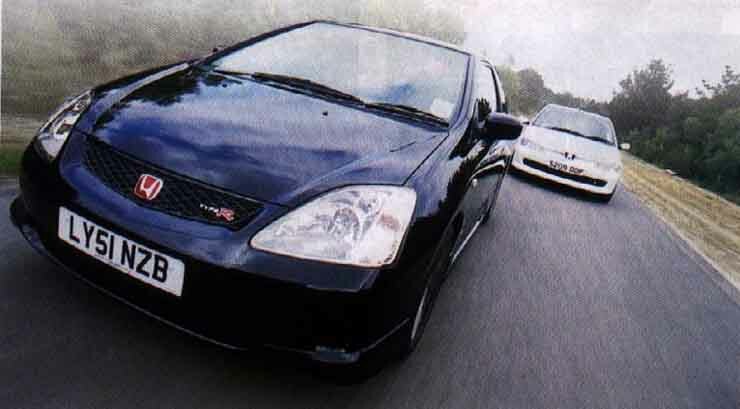 The burning issue: which of the CCC staff cars is best, 306 Rallye or Civic Type-R? There's been a fair bit of banter between the Ed and I since I bought the Pug and he took delivery of his brand spanking new screaming Civic Type-R back in December. It's not so much the "my car's better than yours" type banter but the "oh, in got in the car this morning and discovered it's got heated wing mirrors" or "my new CD sounds really nice on my stereo". The kind of minor niggling that tends to build up after a few weeks. All right, so the Pug's a bit spartan. It doesn't have a CD player, air-con ir auto sphincter massage control. But it still oes like the proverbial brown-stuff off a shovel. And it's still one of the best performing, and looking, off-the-shelf hot hatches ever produced. But it's not made any more, and it seems lately that Honda is the only mass motor car manufacturer which has been willing to step up to the crease and take a swing at tonking the traditional hot hatch formula for six. Its engine is aggressive, the ride is on the stiff side of sporty and it demands to be driven within an inch of its life every time you turn the key. As far as hot hatches go, the Civic Type-R is thrilling - and it's answered every performance related question we've levelled at it. But is it any better than the Pug, and if it is, by how much? We really needed to find out for sure. On paper, the Civic should just have the edge over the Pug. Despite it looking bulkier, the Civic's only five kilos heavier (at 1204kgs) but has an extra 30bhp to haul its lardy-looking hulk about the place. What's interesting is that torque figures are fairly similar between the two (Civic 145lb.ft at 5900rpm; Pug 142lb.ft at 5500), and quoted factory 0-60mph times are within a tenth of a second of each other. The trick would lie in just how useable the Civic's power is below the V-Tec's operational optimum and just how tired the Pug's engine was after a reasonably busy life in the hands of CCC's staff. 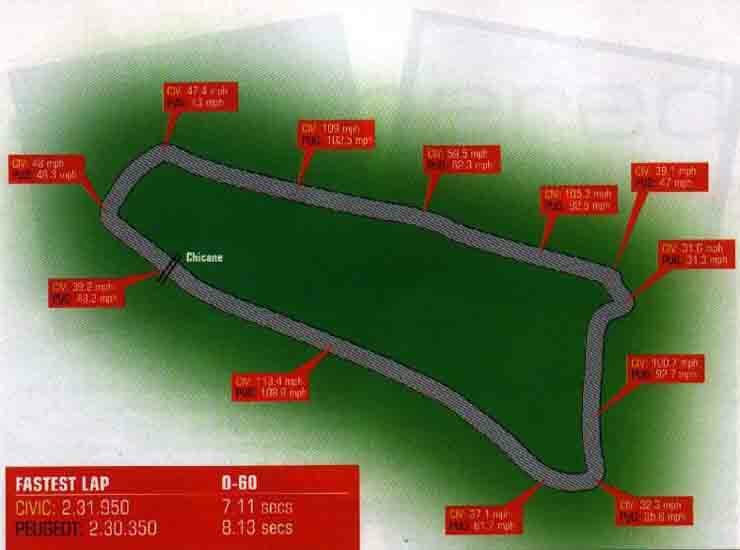 Our three mile long test track provided a road-real mix of B-road straights, sweeping corners with camber changes, junctions to upset the straight line balance of the car and slow speed bends with a five bar cone chicane thrown in for good measure. Surface conditions ranged from flat asphalt to lumpy tarmac, and a dry dat meant grip leels were superb and wouldn't alter through the test. Steve tackled the track first in the Civic and, after scaring himself at 121mph (the fastest logged speed of the day) over some lumpy bits in the road, settled in for two, more sensibly paced, quick laps. The key to using the power of the Civic's engine is to keep it ticking over withtin its peak power band which means removing your brain's sensible road driving chip and replacing it with your touring car one. The car really comes alive at 5500rpm and by 6000rpm, as it winds past the point where it develops peak torwue, it really wakes up. Keep your right foot planted and the Civic will stretch to 8000rpm, where its full 197bhp is on tap. To be brutally honest, revving the life out of the car takes a little getting used to, but once you've developed a taste for the Honda's top end performance, it's hard to get out of the habit. The Civic rode the fast straights smoothly but was upset by the bumps on some sections rather harshly which, given more time to learn the track, could have been avoided. 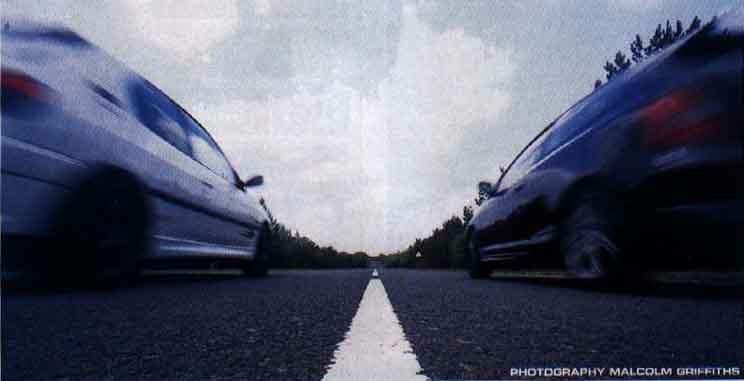 The Civic took each of the bends slightly quicker than the Pug but low down acceleration wsa where it lost ground to the French hatch. Though slower almost everywhere, the Pug's sure-footed handling, and strong engine low down, handed it a slight edge over the Civic. 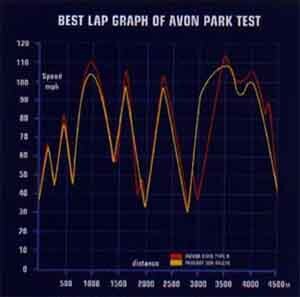 Steve's best straight-line speed, subtracting his buttock clenching 121mph scare, clocked in at 113mph. I held the Pug at 108mph (because it's mine and I pay for the repairs) and tried to preserve a bit more speed through some of the tighter corners. Where the Civic felt glued to the road, the Pug loosened a bit at the rear but still managed to go everywhere it was pointed. Feedback through the steering wheel is also better on the Pug, and steering weighting - though I'm biased - feels just as it should. Quite how the Pug managed a better lap time than the Civic is beyond me - but a set of worn tyres and smoking brake discs following my run was probably the biggest hint. The discs and calipers are stock standard and due for replacement with APs as soon as I can get up to Coventry. But I can't claim too much glory. There was only a second in it and over an unfamiliar, three mile track, that's not enough to make it a conclusive victory. Still, it doesn't stop me feeling slightly smug (you forgot to mention that you didn't slow down past the disabled riding school at 3km like I did! - Ed). From standing, there's not much in it. The Civic's quicker to 60mph, but the logged times aren't representative of our closest run where Steve pipped me by a car length in his Civic. Where the Civic wins hands down is part 60mph as by then the engine's worked itself into a frenzy and is ready to be let off the leash. At our head-to-head standing start, Kirkie sped off into the distance and completed his quarter mile in just 15.5 seconds and carried on to 100mph 2.74 seconds later. I didn't bother. The Pug has proved it's a capable machine ever since it was first let loose on the British and French buying public four years ago and very little has been able to match it since. Both Steve and I agreed that there's a lot more to come from these cars: two drivers with bigger balls for a start (mine are on order) so expect a rematch sometime soon.